A Christmas wreath is a wire structure decorated with a range of tree components. Real ones tend to have juniper pine needles coupled with berries and pinecones. Artificial ones can be almost anything. You can opt for a more traditional look with snow-covered pinecones and other natural-like but plastic pieces, or you can buck the trend with something more modern. Nowadays, you can select from a “less is more” wreath which leaves the door of opportunity open for your touch. You can then add LED lights (or find a Christmas wreath with them already on it) and ribbon and silk. The sky’s the limit. If you plan on buying a Christmas wreath, there’s no time like the present. They are only getting more expensive, and if you want to buy one as cheaply as possible, do so when manufacturers purchase materials in bulk to make them cheaper for consumers. If the time is now to go out shopping, you can check out these options below. If you don’t mind whether your Christmas wreath looks real or not, then check out this fantastic option from The Wreath Depot. Not only can you use it for Christmas cheer, but for dressing up your door for any festive occasion. This Christmas wreath features artificial boxwood which is ideal for Thanksgiving, Christmas, and any other occasion. It’s 22 inches in diameter to balance out beautifully on your front door and is suitable for all weather conditions. Whether it’s raining, snowing, or sunny, you can count on it to last the distance. It even has UV-rated components so the sun won’t ruin it. 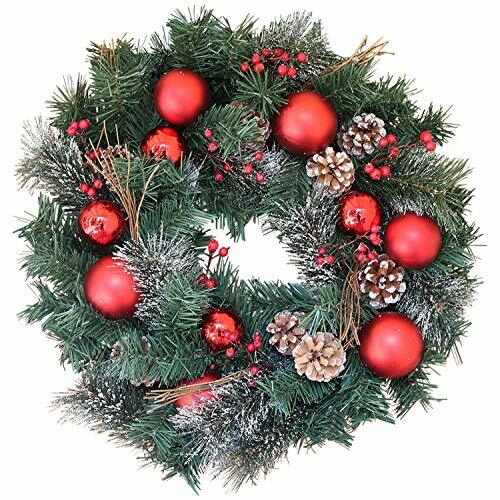 What’s more, this Christmas wreath is around five or six inches deep, comes with a built-in hanging loop for easy adhesion to your door, and comes in a gift box. As a result, you can offer it as a present to a loved one. The only thing some people don’t like about this Christmas wreath is that it not only isn’t real but doesn’t look it either. The plastic boxwood component has a little too much shine to be able to pass off as real – even from a distance. 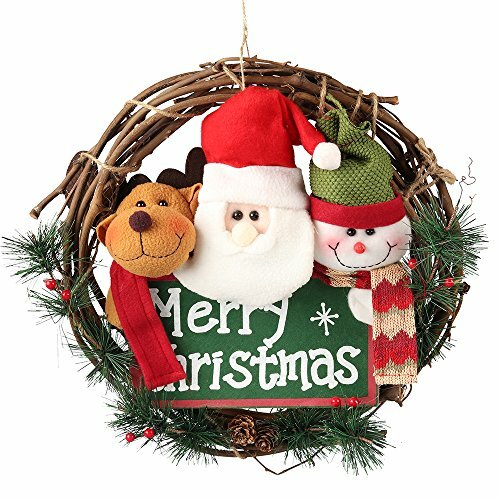 If you love Christmas and everything that comes with it, then set your sights on this Christmas wreath from The Wreath Depot. Not everyone likes the hassle of a natural, real wreath, so these artificial options are ideal for many. This Christmas wreath offers winter berry styling for a pop of color, as well as plenty of plant life that looks real and stands out. It’s also 22 inches in diameter so takes up a fair portion of your door. If you are worried about how much of a challenge it will be to adhere to your door, then don’t be. This Winterberry Christmas wreath comes with a hanging loop to make installation a breeze. It also comes in a gift box so you can keep it for yourself or give it to someone else. However, since it has silk components and is quite a delicate Christmas wreath, it’s not ideal for those who live in colder climes. It will not handle direct rain so will need a sheltered porch away from weather conditions. All in all, this Christmas wreath will be the icing on the cake for your Christmas decorations. 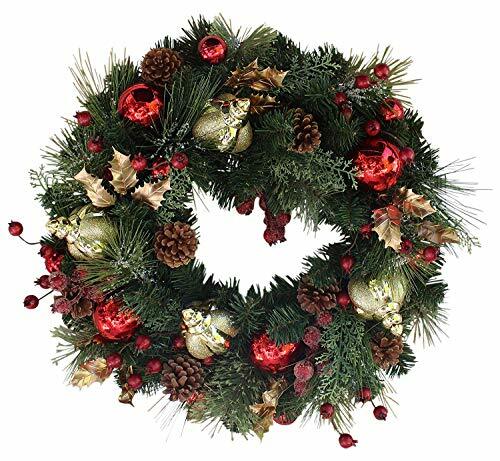 If you want to go all out with decorations this year, then stop neglecting your front door and buy this Christmas wreath from The Wreath Depot. Even though the price tag may be a little more than you would expect to pay, you will quickly realize it’s worth it. 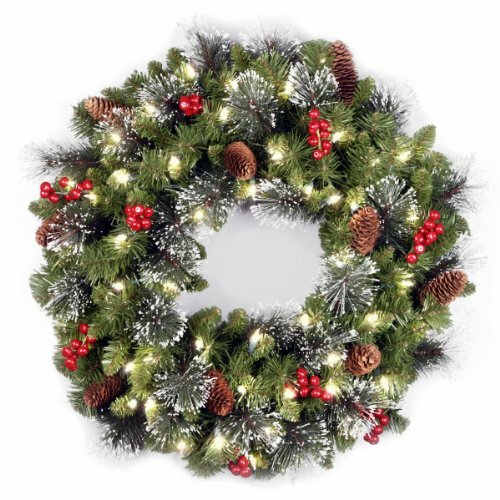 This artificial Christmas wreath is unlike many others on the market. This Christmas wreath goes big on the details. It delivers on festive cheer while incorporating faux red berries, snow-tipped faux evergreens, deep red ornaments, and pinecones in a Whitehall style. It’s also 22 inches diagonally with six to seven inches of decorative touches all around. It doesn’t get much better than that. Or, does it? 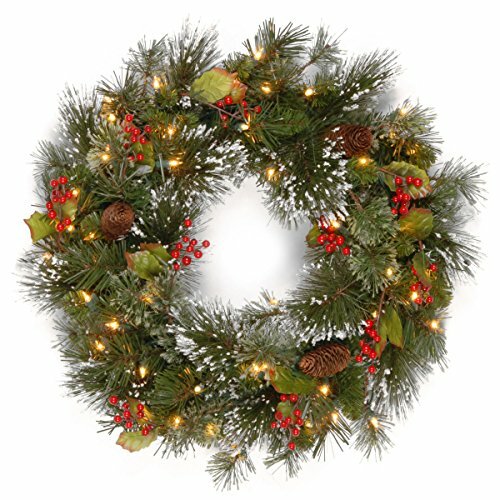 When you buy this Christmas wreath, you also get it within a sleek and stylish white Christmas gift box. You can then give this wreath as a gift or keep it for yourself. It might be time to splurge and add a little festive cheer to your front door. If you don’t mind having to put effort into stretching your Christmas wreath out, then set your sights on this one from Fine Expectations. As a Juniper pine wreath, it looks every bit real and perfect, but is artificial and requires less maintenance. When you receive it, you need to move the wreath components outward to change its diameter from 26 inches to 30. Once you do that, you will enjoy how real the color, texture, and structure of the Christmas wreath looks. It may not be real Juniper pine, but it seems like it is! The difference is, this one lasts a lifetime, and you don’t have to clean up dead pine needles. What’s more, this Christmas wreath is suitable for more than only your front door. While it’s going to stand out in your neighborhood if you do attach it to your door, it’s also going to look the part on your mantle, staircase, or another area of your house. You do pay more for this Christmas wreath than you would others, but there is a reason for that. The heavy gauge wire sees it last a long time, while the attention to detail is second-to-none. Enjoy the combination of pinecones, cedar sprigs, and juniper pine to add festive cheer to your property. 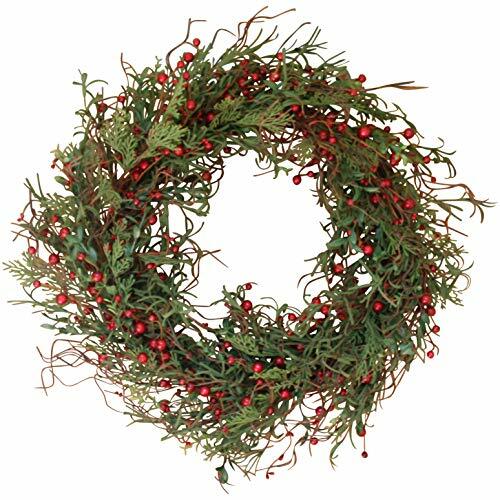 If you are tired of the Christmas wreath market being filled with poor quality options that do nothing but disappoint, then take a look at his winter red berry wreath from The Wreath Depot. There is no denying you need to open your wallet a little further than usual to buy this wreath, but you won’t be sad about doing so. Once the wreath arrives, its quality and style will impress. The attention to detail is incredible. Enjoy the beautiful gold twigs, red berries, pinecones, UV-rated silk, and faux evergreens that add a touch of festive cheer. All of these details together make it a wreath that looks real but isn’t. Being artificial also means you don’t need to worry about it dying. It lasts forever with enough care. This wreath is also larger than many others on the market. Measuring it diagonally, it’s 24 inches, as well as having six or seven inches of detailing to make it thick and robust. It also comes in a gift box so you can choose to keep it for yourself or gift it. Don’t settle for less than the best when a wreath such as this one is readily available. If you want to have the best-decorated house on the street, then purchase this Christmas wreath from Village Lighting Company. Unlike traditional wreaths that feature real plants and not a lot else, this one is multi-faceted. You benefit from a life-like wreath without all the maintenance and beautiful lighting to seal the deal! 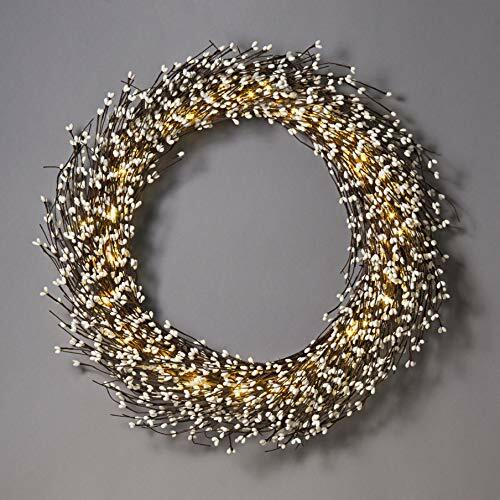 This Christmas wreath is pre-lit with 50 white colored LEDs. These all run on a battery-powered unit which comes with a remote and an option for a timer. They are UV-resistant, energy-efficient, and use less power than incandescent bulbs. What’s more, they enhance the beautiful styling of the wreath far more than other options that don’t have lighting. The branches are even something special, featuring PE and PVC to last the distance. They are also adhered to a steel frame to ensure they won’t come to any harm with daily use. What’s more, you can use this Christmas wreath on your front door, your fireplace, or anywhere in your home that needs a bit of festivity. There’s every reason to take a closer look at this option for Christmas decorating. The photos of this Christmas wreath do not do the product justice. Even though it might look plain and a little bit boring in pictures, when you receive it in the mail, you will be impressed and pleasantly surprised. It’s anything but dull and boring. You can buy it in four sizes; small, medium, large, and extra large, with diameters of 12, 14, 16, and 18 inches. Each of the size options has thick detailing that’s five inches deep. What’s more, they are entirely artificial but look real. Therefore, you can fool your neighbors but don’t have to concern yourself with maintenance. Instead, you can hang it indoors and outdoors for several years to come. This wreath also features faux boxwood, eucalyptus, and purple tendrils – all attached to a grapevine base. The artificial plastic detailing is second to none. You do pay more for this Christmas wreath than you would others, but the quality will make you realize it’s entirely worth it. Not everyone loves the green and traditional red decor of Christmas and natural Christmas wreaths. You might feel like all your neighbors have a wreath so you must have one, but there’s no reason why you have to hang one with colors and styling you don’t like. 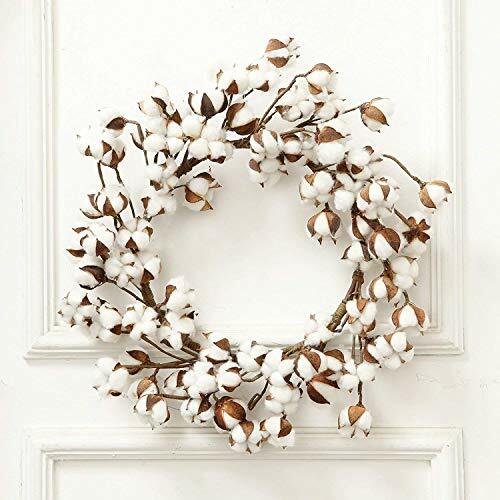 Instead, you can buck the trend with a farmhouse-style Christmas wreath from VGIA. When you buy from VGIA, you get to choose from a wreath or garland – both of which will look stunning in any home. You can hang them above your fireplace, your staircase, or your front door. Anywhere you want to add a touch of festivity; this Christmas wreath can be of assistance. It’s also expandable up to 24 inches and includes plenty of fluffy cotton balls. Check these are all secure in place as they can fall off. This Christmas wreath is also handmade, real, natural, and entirely adjustable. It’s not like any other Christmas wreath on the market which may be the answer to how to add festive cheer without green and red. If you require a Christmas wreath without all the bells and whistles, then this one from Wreaths for Door could be an excellent option. Most wreaths already have all the detailing they require to look the part, but what can you do if you want to customize one? It’s a rarity to find one that allows that, but this one does. You can add lighting, ribbons, or anything else. It offers a minimalistic approach with only sparkles, red berries, and frosted Balsam evergreens. Everything else is up to you. It costs more than many others on the market, but its large size and versatility for use almost anywhere can make it worth the price. It could be worth a closer look. Christmas is only ever 12 months away at the most, which makes any time of the year the perfect opportunity to purchase a Christmas wreath. However, there are so many from which to choose that it’s all too easy to get it wrong. And, given that the majority are quite expensive, it’s not something you want to have to do twice over. Especially when you need as much money as you can get for presents, holidays, and food for the dinner table. When the time comes to buy Christmas decorations – including a wreath, don’t be afraid to do your research. You might feel like you need to hurry – as the world begins to go crazy from November onward, there is no hurry. Instead, focus on getting it right and letting the manufacturer or supplier deliver it to your door in perfect condition. What’s more, when you take that little bit of extra time to find out what you want, there is an even bigger chance than before that you’re going to get the Christmas wreath you want. Below, you will find many of the considerations for choosing a Christmas wreath. Pay attention to the size of the wreath, especially when you figure out where you want to put it. If your door is quite large, then your wreath needs to be as well. Otherwise, the balance will be off. However, if you’re going to hang it on a staircase or above your fireplace, then it can be smaller. 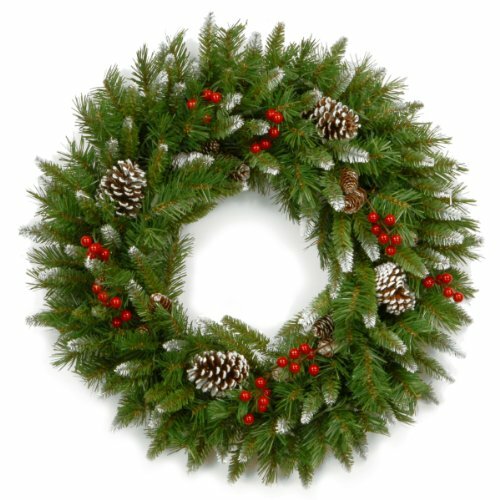 Most large wreaths have a diagonal measurement of between 22 and 30 inches. This sizing is standard for a Christmas wreath and will not disappoint. No one wants a Christmas wreath hanging on their doorstep that will embarrass them. Most people want to decorate their homes to stand out in the neighborhood, but not for the wrong reasons. Don’t choose a wreath you don’t like online. It won’t look any better in person. Fortunately, there is an abundance of options that are bound to suit. You can go for the more traditional options with red berries, frosted pinecones, and juniper pine, or, you can select something contemporary and modern with LED lighting and other technological advancements. The best Christmas wreath is one that’s effortless to install, not relying on the hole in the middle to be the means of hanging it. Select a wreath with a hook installed into the top center of the wreath. It can save a lot of hassle during installation. If you are cutting timing fine, and Christmas is only around the corner, then consider shipping when buying a Christmas wreath online. Some manufacturers offer delivery before Christmas, but others don’t. Many businesses also use drop shipping services which can extend the wait for delivery. Check with the supplier if you are not sure. The versatility of a Christmas wreath refers to where you can use it. Unfortunately, not all Christmas wreaths are ideal for use outside, especially if your front door is not sheltered from the weather. If you know that it will need to stand up to harsh weather conditions, then make sure it is built to handle it.